Attracting and feeding hummingbirds. 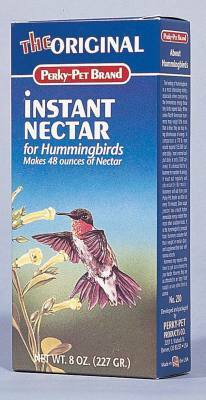 This easy-to-use instant hummingbird feeder nectar will delight the tiny birds, bringing them back to your feeders time and time again. The Perky-Pet original instant nectar 8 oz. box makes 48 oz. of nectar when mixed with tap water. It provides natural sweeteners, with no boiling required.